The Witchcraft Academy has opened, and LeoVegas Casino is takig you off the beaten track for for weeks of enchanting prizes and sundy spins. Jump on your magic carpet and fly off to the Bahamas, las Vegas or Victoria Falls! You have the chance of increasing the magic every Sunday at LeoVegas Casino! 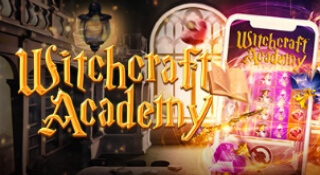 Simply headover to the Witchcraft Acadamy at the casino site between 12:00 and 16:00 and enjoy your free spins!